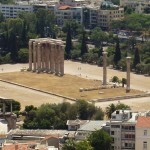 The ruined Temple of Olympian Zeus (also called Olympeion) is dedictaed to Zeus, the king of the Olympian Gods. 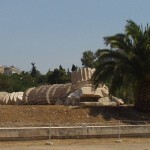 It is located within a walking distance from the Athens centre. It’s construction started in the 6th century BC and it was intented to be the hugest of all temples. 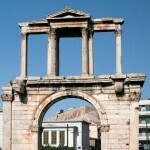 The works stopped in 510 BC due to political disorders. The temple remained uncompleted until 174 BC – in this year the king Antiochus IV Epiphanes started the reconstruction, replacing the limestone with the high-quality Pentelic marble and the architectural style was changed from Doric to Corinthian. 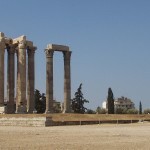 Temple of Olympian Zeus was badly damaged during the Herulian sack of Athens in 267. The Greek name: Ναὸς τοῦ Ὀλυμπίου Διός.